�����Most dealers are reporting that the Whitman Baltimore Expo was a success. This is typically the least active of the three annual Whitman shows, however, there were probably about 100 more bourse tables than this time last year. Overall, public attendance was good despite the dramatic fall in metals, and dealers were active, looking to fill orders for coins in the $500 to $15,000 range. Several dealers had more retail sales than normal for a June Expo, but buyers were selective. A willingness to lower asking prices was needed for those looking to reduce inventory for the summer. �����The success of the show carried over to the Stack's Bowers Auction where buyers found lots of action for numerous rarities. 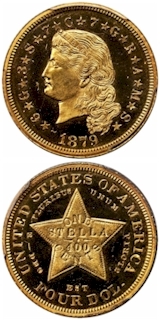 One of the highlights of the sale was the 1879 $4 Gold Stella with Flowing Hair; it is certified by PCGS as PR64 Cameo and realized $164,000. With only 23 certified in this grade by PCGS, it is always a popular coin when available in auction. In June of last year this coin had an FMV of $206,250 so the new buyer must feel like they got quite a bargain for this near gem. �����One of the more sensational coins in this sale was the 1880 Shield Nickel in PCGS MS65. 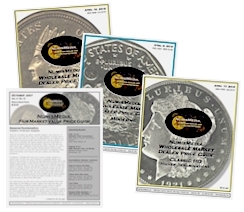 With only ten coins total certified by PCGS and NGC, this was a rare opportunity to acquire the key coin in this series. As far back as May 2006 this coin had an FMV of $55,250. The current FMV is $66,950 and is sure to need some upward adjustment. Below are a few other important highlights from the Stack�s Bowers Sale. 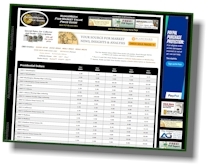 �����In this week�s Moderns Wholesale Market Dealer Price Guide, Modern Eagles and other bullion related charts are covered with declines. The falling metals have most buyers skeptical, waiting for the next indication of market direction. Nevertheless, series from Lincoln Cents to Washington Quarters have numerous advances in the higher grades. Serious Registry Sets collectors are very competitive for these top quality modern coins. �����A variety of MS66 and MS67 Modern Lincoln Cents are on the rise, and even the 1943 PDS in MS68 is up this week. �����Proof Jefferson Nickels from 1938 to 1964 in PR66 to PR68 are in demand with many of the Deep Cameos higher. The 1956 in PR68 DCameo moved up to $2,725 Market and the 1961 PR69 DCameo jumped to $865. �����In the Washington Quarter charts, there are increases for 1932 through 1940 in all Mint State grades. In addition, many of the MS67 coins are higher from 1932 to 1953. 1934 D in MS67 now has a Market price of $6,350 and the 1936 D is $6,450 in the same grade. The 1934 D has a population of only 11 coins in MS67 with none higher and the 1936 D has just 16 total in MS67 and none grading higher.